EXTRA LIGHTWEIGHT - Our 13 feet long fruit picker tool is made up of aluminium - much lighter than fibreglass or wood poles such that you do not feel any fatigue and strain of fruit picking. The light weight also enables you to move quickly to successive positions. 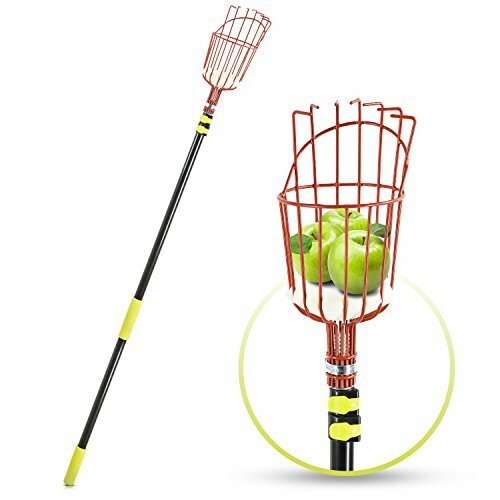 BRUISE FREE FRUIT - This incredible or rather best fruit picking tool comes with a deep basket & a metal ring to securely hold the fruits, and a bruise free sponge helps avoid any cuts or other damages to fruits while picking. The basket can conveniently hold weight of several fruits. EXTENDABLE POLE - The telescopic pole handle can be extended in three steps such that you can reach fruits at all heights, and conveniently pick the fresh and ripened fruits. Extending our fruit picker garden tool is made easy with a smart locking and unlocking yellow buckle. DURABLE & EASY TO USE - This fruit picking equipment lets you target individual fruits as you can see the fruit you are picking. Simply hook the fruit between the prongs and gently pull it to pick. The aluminium pole will not bend, break or warp, and will surely last a lifetime. 100% RISK-FREE SATISFACTION GUARANTEE - 100% risk free satisfaction guarantee is also offered to let you buy with confidence; no questions asked. However, we are quite sure that you will be super impressed with its quality and appropriateness for all kinds of fruit picking.